You may not realize but having a flashlight can save you from a lot of troubles. 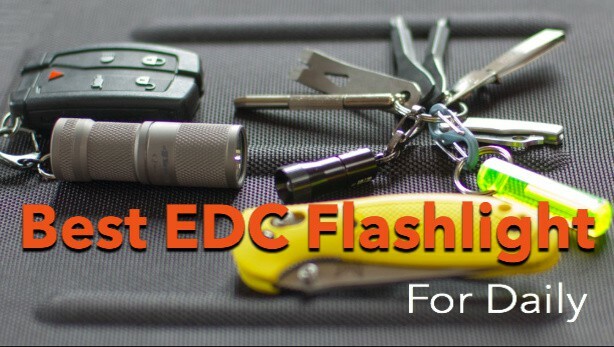 Luckily, there are all sorts of flashlights designed to fit various uses, like medical assistance, and survival as discussed in our previous blogs. However, one of the most useful flashlights can be the best small flashlight. But, when you’re out getting one for yourself, does the size really matter? Well, certainly it does. The smaller your flashlight, the easier it is to operate. To illustrate, the best small flashlights are the ones that will light up your way, without making you worried about carrying it around with other equipment. There are many flashlights which look small and feeble but are powerful enough to do the job for you. Personally, I love camping but tend to carry a lot of stuff, which keeps me struggling to manage my things along the way. Small Flashlights are just the thing for me. But, when I set out to buy one, I saw that small flashlights have quite a competitive market. 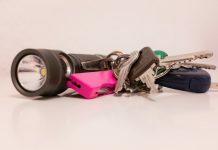 So, here’s a review of the best small LED flashlights which I came across on my quest for the perfect pocket flashlight. 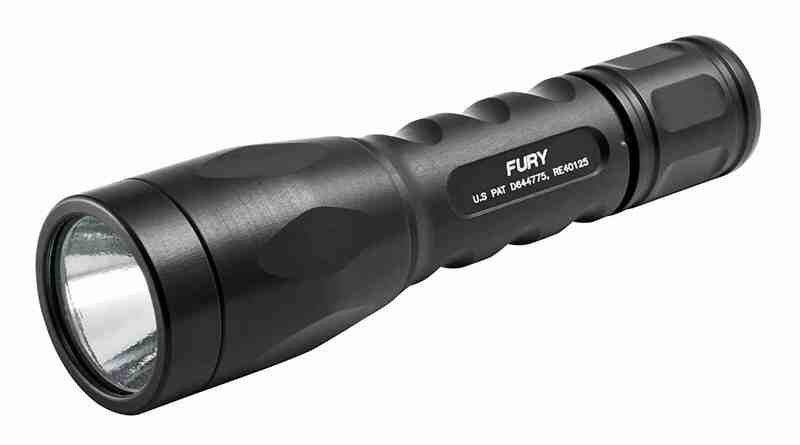 This small flashlight from Surefire is sure to impress you with its amazing features. First of all, it’s lightweight and pocket-sized, but don’t get fooled by its appearance. It can give out about 15 to 500 lumens of bright, uniform light. Equipped with a clickable switch at the tail, it is extremely easy to handle. Other than that, this little thing has a tough aluminum body, which makes the device durable. Besides that, the beam it produces is flawless. This is because of its micro-textured reflector which throws out a smooth beam. Also, it has a tempered window to maximize the light produced and resist impacts. Only five inches in length, it runs for up to 46 hours straight on a low setting. It has a high setting as well if you need more brightness. What’s more, the manufacturer gives a lifetime warranty for the product. This 500 lumen, small flashlight provides the utility of a searchlight. This is because it has a C LED brightness system which will give eye-dazzling brightness. Constructed from durable anodized aluminum, it’s equipped to protect itself from any external damage. In addition to that, it has a knurled body to give you a strong, single-handed grip. For added accessibility, it’s made with an anti-roll formula. This means it will not roll out of place if you decide to put it down somewhere. Besides that, the light is shock-proof and comes with a staggering 50,000 hour lifetime. The battery runs for an hour at the high setting, while you can push it to a maximum of 3.5 hours if you use it carefully at low setting. You get an uninterrupted, uniform beam regardless of the diminishing battery. Because of its Deep-dish parabolic reflector, the beam it produces is concentrated and bright. Being one of the pocket-sized flashlights with an IPX4 rated design, it is extremely durable as well. 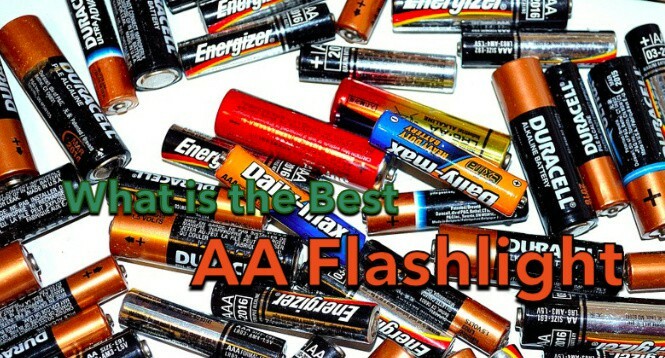 You can go through our previous blogs to read about these ratings in other outdoor flashlights. 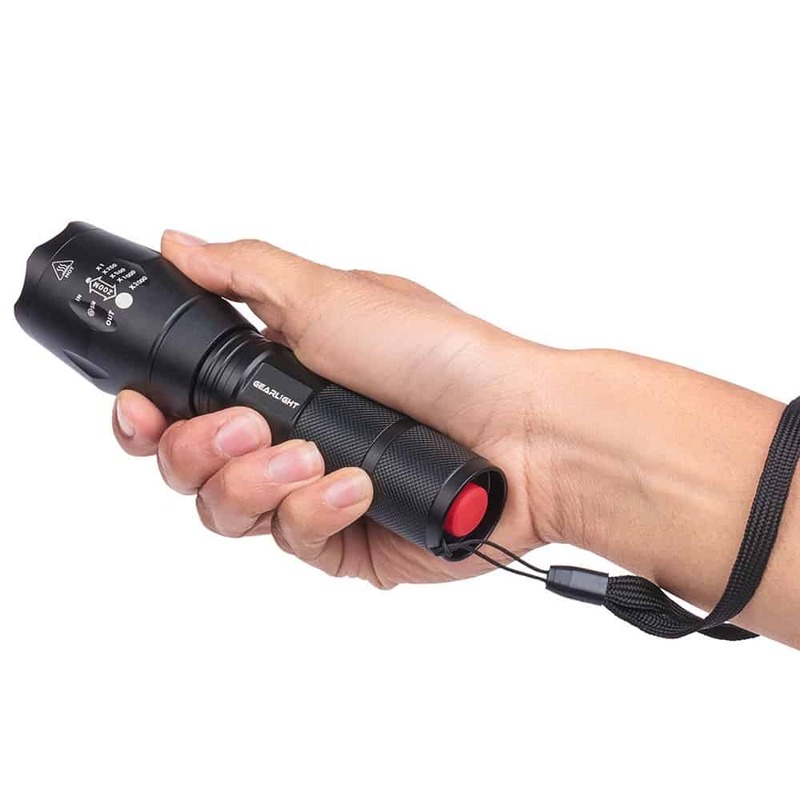 This small, bright flashlight from MsForce is your perfect companion for an adventure trip. It’s a reliable light source when carrying out rigorous outdoor tasks such as hiking or setting up a camp. You can easily judge it’s reliability through its potential to work with police and army forces. 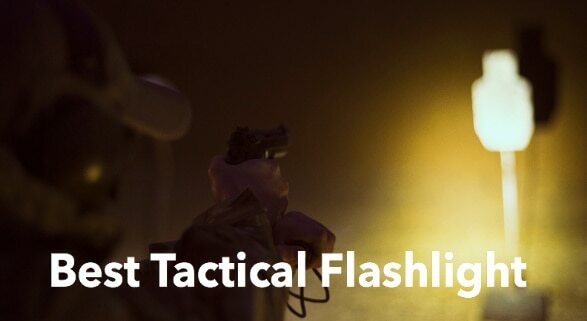 If you find that amazing, you’ll also like our article about flashlights for firearms on our blog. Other than that, it offers a great level of customization. You can adjust it to five levels of brightness according to your need. Also, it’s rechargeable batteries give an eight-hour runtime so you don’t need to be concerned about its battery now and then. This small flashlight gives about 1000 lumens of light which is great compared to its size. Additionally, it comes with a belt clip, string loops, and a skid-proof system, so you won’t lose your torch along the way for sure. 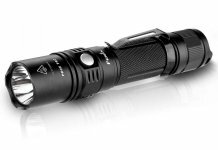 If you are looking for endurance and durability, then this is the best small flashlight for you. Made out of aircraft-grade aluminum, this model is safe against any external damages or corrosion. Also, the hard-anodized finish gives a sleek metallic look and a good grip so it won’t slip away while you’re handling it. In addition to that, it has an anti-roll shape so even if it does fall during a mishap, it won’t roll far away from your reach. Also, the glass lens has an anti-reflective coating which ensures the uniformity and proper concentration of the beam. The operation is a breeze. A stainless steel side switch lets you switch the output mode easily. Its smart output technology identifies the last used output setting when you turn it on so you don’t have to set it again and again. The best part is, this little bundle of light will remind you when it needs to be charged through its voltage system. Most importantly, its waterproof system passes the IPX-8 standard which means you can use it underwater for about 30 minutes. So, don’t worry if you drop your flashlight in the water. Also, you can use this flashlight to search for things underwater. Anker brings the best small LED light which is powerful regardless of its size. This small pocket-sized flashlight produces about 900 lumens of bright, LED light. Not only that, but its beam reaches as far as a 1000 ft, that’s nearly the distance of two consecutive football fields! Also, this amazing flashlight loves working in the rain. 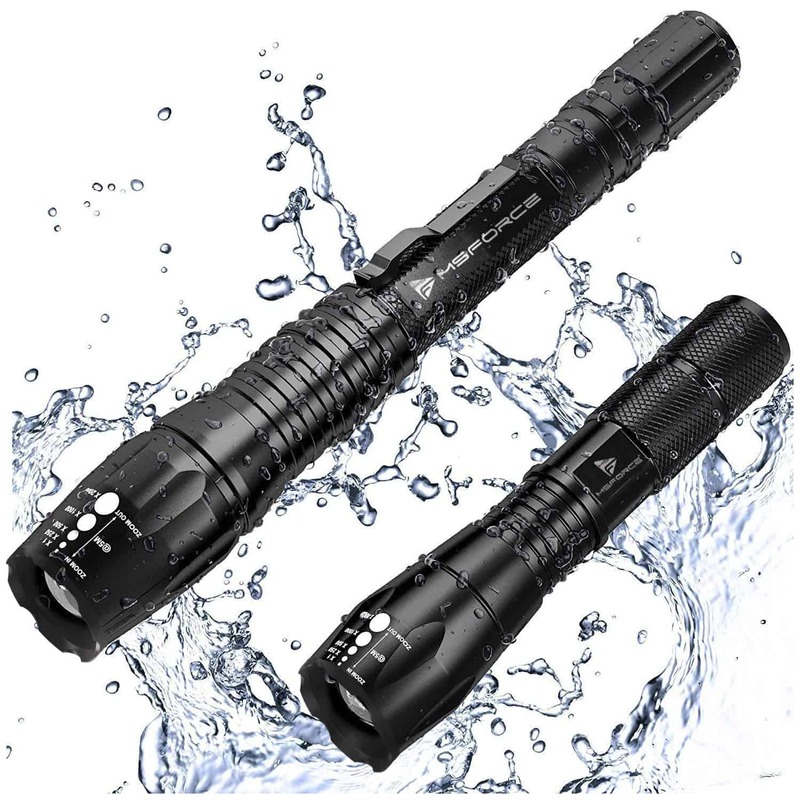 With its IP65 rating for water resistance, it stays illuminated through heavy rain and can also work while partially submerged in water. Other than that, it’s tough against rough handling and impacts due to its aluminum body. On the whole, it offers a very accessible design. Its small body will easily fit in your pocket, and you don’t have to worry that it’ll slip from your grip because it won’t. The package increases its overall utility, including a wrist strap, USB cable for recharging your light, and an 18-month warranty. This model by GearLight LED is the best small flashlight when it comes to durability. Great news for a clumsy user, it’s proven to be indestructible and will remain unscathed even after facing a 10-foot fall. Also, it’s water resistant system allows it to stay partially submerged in the water, so don’t worry if you drop it in the water because it will remain safe. Besides that, this model is highly customizable. You can adjust the brightness to your needs, ranging up to five different modes. Other than that, you can also zoom in and out through its focus adjustment system. The light is state-of-the-art. It gives a beam length of up to 1000 feet. It’s a military level flashlight, all in a pocket-sized compact design. Don’t judge it by the size because it’ll give you a trustable company for hours after it’s fully charged. Also, in the span of these hours, you won’t notice the light diminishing at any level as the battery gets used up. PeakPlus presents the best small flashlight in a fully equipped kit. 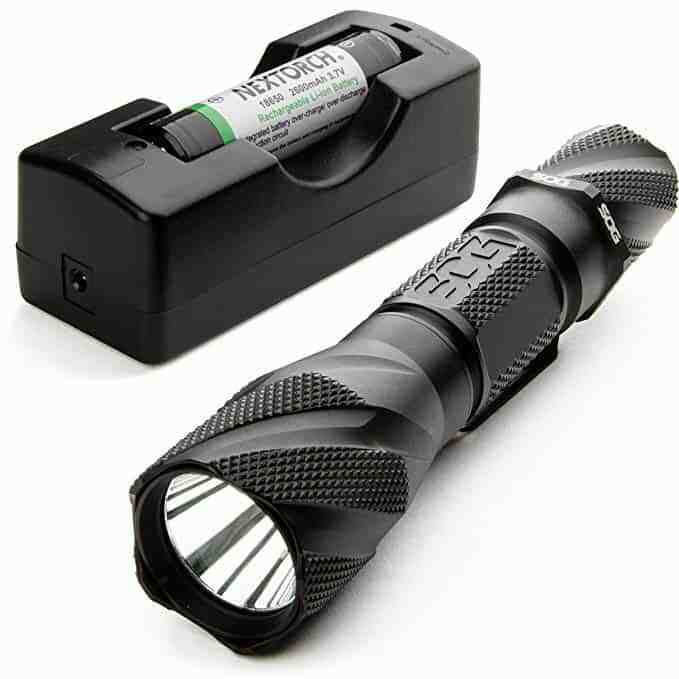 The package includes a rechargeable battery, a case to store your flashlight, a battery holder, and a user manual for complete product utility. Moreover, it has a high-tech light system. It has high power lumens and is proven to be brighter than contemporary flashlights regardless of its size. Also, you can choose from five adjustable light modes for your desired brightness. The focus can also be adjusted by zooming in or out, to provide the best vision from both far and close ranges. Most importantly, it’s usable for all situations. Having a heavy-duty construction, it is adaptable to rain, high temperatures, and impacts. This gives you a multi-use flashlight for hiking, camping, and other outdoor activities. The Fenix E12 is the newer and improved version of the Fenix E11. 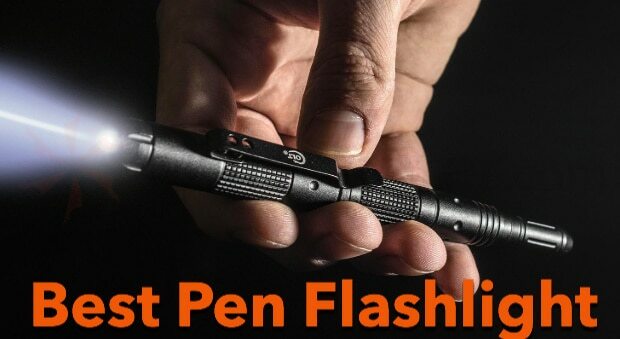 It is one of the smallest flashlights available that you can take anywhere and use it as a proper, fully functioning flashlight. 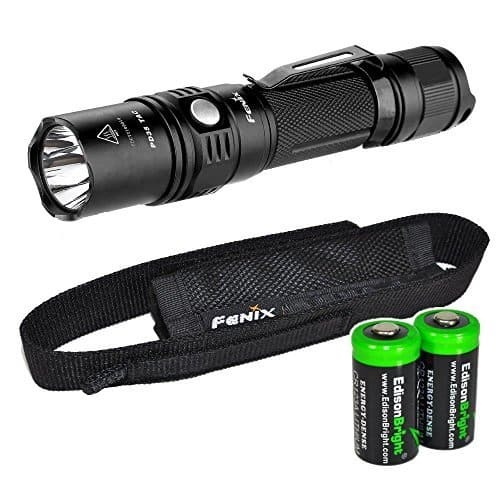 Utilizing one AA battery the Fenix E12 has a beam length of 289 feet. In addition to that, the CREE XP-E2 LED bulbs have a life expectancy of 50,000 hours. They put out an even and soft beam that is amazing for lighting up close distances as well as longer ones. One of the main issues people usually have with flashlights is that the brightness levels seem to flicker. However, the Fenix E12 has used digitally regulated output to maintain the brightness levels you select. 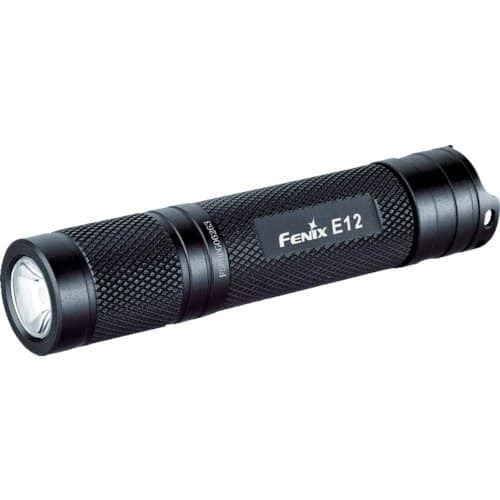 Furthermore, the Fenix E12 features a type III hard anodized anti-abrasive finish on an aircraft grade aluminum body to make a strong flashlight that won’t break upon a little fall. Also, to secure against improper battery installation, the E12 has reverse polarity protection. We feel that light like this would be an extraordinary back-up flashlight to have with you whether you’re hunting or anything else. Like some of the previous models on our list, this model also has a hard anodized finish. This makes the flashlight durable on the grounds that the finish shields elements from affecting the aluminum material. Furthermore, you get 3 options for LED colors. You can change the shade of the lighting and you can pick between Red, Blue or Green. Such alternatives give you the freedom to utilize the best-LED color that you would need for the outdoors. However, it isn’t only the LED colors that you can change. You can change the different lighting modes as well. You can choose from 4 different light modes. There is a high, strobe, medium, and low mode. Depending upon the circumstance, you can pick the lighting mode that works best for you. 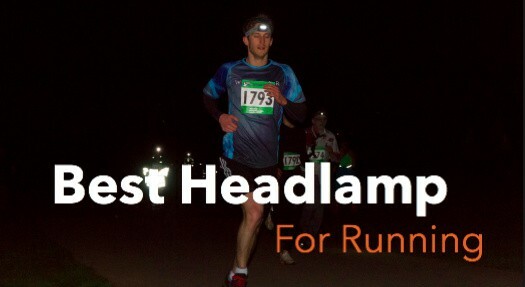 For the high mode, you will get 944 lumens with a runtime of 3.25 runtime. The low mode then again gives 37 lumens and a runtime of 29 hours. The flashlight works using disposable CR123 batteries. However, these batteries are not included in the package, therefore, you’ll have to make that investment yourself. The last flashlight on our list is certainly not the least one, this SOG Dark Energy flashlight has a great number of features. With a noteworthy light output of 750 lumens, this is amongst the brightest flashlights. The sort of penetration and range one gets with this model is worth appreciating. In addition to that, the SOG comes with 4 light modes which you can use depending upon the situation and requirements. The four modes include momentary on, full on, low, and reading. For every one of the modes, you will get a different beam strength. The full-on mode is perfect for those individuals who need to use the full brightness of the flashlight. Whereas the reading mode offers 25 lumens which should be sufficient for you to read properly. Furthermore, the model is created from hard anodized aluminum. The main reason behind this was to give the users a product that not only works but is also durable. In addition to that, the body of the flashlight is also textured so that it doesn’t slip. 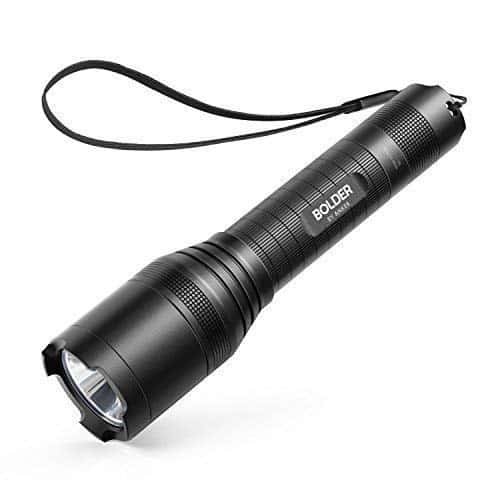 Lastly, the best feature about this flashlight is that it operates using a rechargeable battery which is incredibly useful as it saves you the hustle of buying new disposable batteries after every trip. 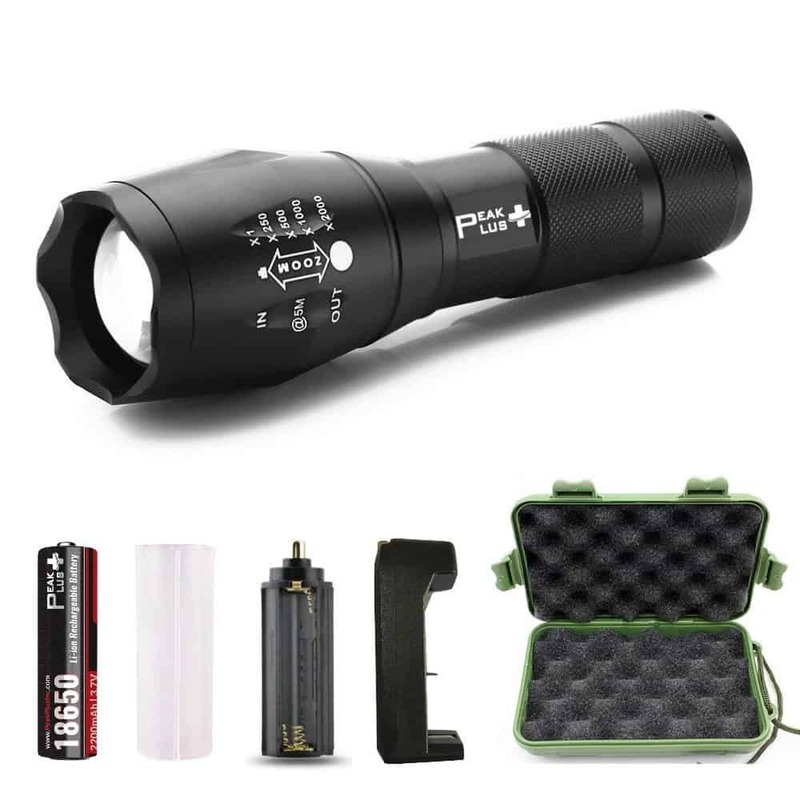 If this is your first time shopping for a flashlight, then you must’ve got a great insight into the varieties available from the review above. Here’s a list of boxes you should tick off your checklist when buying a small flashlight. The brightness of flashlights is measured in lumens. You should check how many lumens a model gives especially in the case of small flashlights. Usually, 100 lumens are enough to guide you along your way, but some small flashlights also offer up to 1000 lumens of brightness. 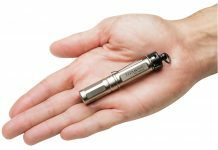 If you are looking for a small flashlight, then keep in mind that the most compact and accessible size is five inches which can easily fit your pocket or backpack. But, when looking for a particular size, don’t compromise on power. Many brands like Anker and GearLight have small but powerful flashlights, so do your research before investing in one. Obviously, you’ll want your flashlight to last you long. In that case, go for one that gives maximum durability. Anodized aluminum flashlights are the best in this case. They are safe against abrasions, corrosion, and external impacts. Also, IPX standard rating for flashlights shows how much endurance it has when exposed to water. The operation of the flashlight should be easy and customizable to your needs. Some flashlights have three modes while others have five. Also, focus control varies from one model to another. Other than that, the grip should be reliable so the flashlight does not slip from your hand. Anti-roll technology is also available in small flashlights. Wrapping this best small flashlights review, I’d like to say that technology has enabled us to have the best features no matter how small a gadget is. So, make sure you make the most of it. It is time to make your life adventurous and exciting by using a bright companion to light up your way.